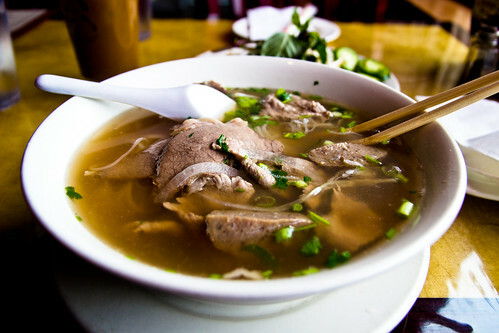 I love Vietnamese pho, and once in a while I just crave it. One of those times happened soon after returning to Pittsburgh, so at my urging we made a trip to Vietnam's Pho in the Strip District. 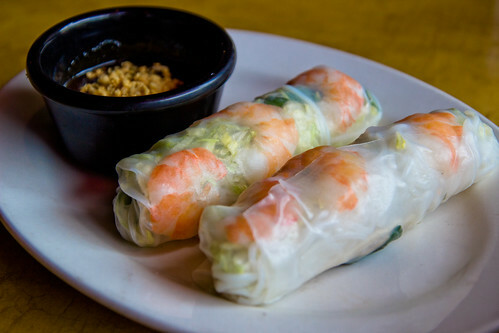 For our appetizer, we got the Goi Cuon, or spring rolls with shrimp, pork, vermicelli, and veggies, in a thin rice wrap. For pho, I usually get Pho Tai, which is just thinly sliced raw beef eye round in a noodle soup, and you have to cook the beef by soaking it in the broth. This time I felt like trying something different, so I ordered the Pho Dac Biet, which is basically a "special" pho with a mix of different beef ingredients, including beef eye round, well done flank, tendon, brisket, beef tripe, and beef balls. It was served with a plate of raw bean sprouts, basil, and jalapeno peppers. I like it with just a small amount of bean sprouts (which you also have to soak in the broth first) and lots of Sriracha sauce. 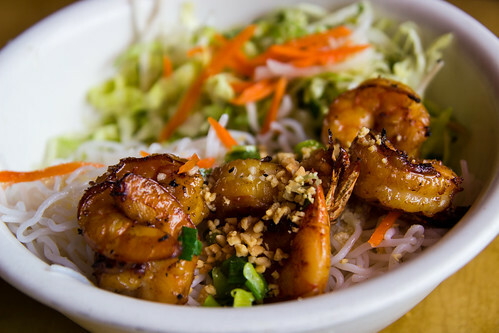 R. ordered the Bun Tom Nuong, or grilled shrimp with bean sprouts, lettuce, herb, cucumber, and peanuts on vermicelli. Everything was delicious and most definitely satisfied my craving for Vietnamese food!